At Custom Brick Fences we understand that security for your home is crucial. We aim to custom-design and install premium fences and gates that provide complete protection for your family members. 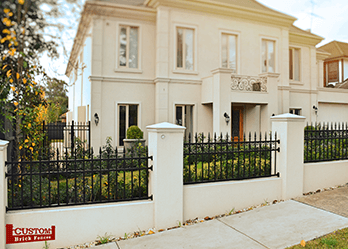 We are known as one of Melbourne’s top fence and gate specialists, catering to surrounding suburbs, from the CBD to Canterbury and Balwyn. Brick fences and gates are great additions to any home, not only do they provide safety but they can enhance the overall aesthetic of any home. Do you want a fence or gate that is visually modern, while providing an added level of protection for your home? 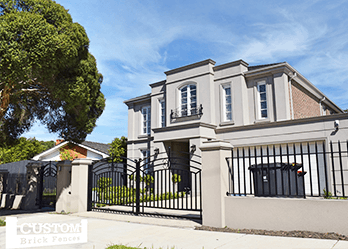 At Custom Brick Fences we offer a number of fences and gates to suit homeowners in Balwyn. From security gates, rendered fences and automatic gates, we guarantee we’ve got the perfect fence or gate for you. We aim to custom-design our products based on your ideas and recommendations. Whether you require a gate or fence solely for security or an elegant look is your priority, we can especially adapt our products to suit your style and requirements. 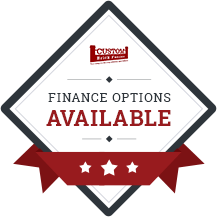 Our experienced and friendly staff members are available to help you choose the best suited fence and gate. Balwyn North house-holds can take advantage of our expert knowledge, friendly service and custom-design options when considering the right choice for their homes. 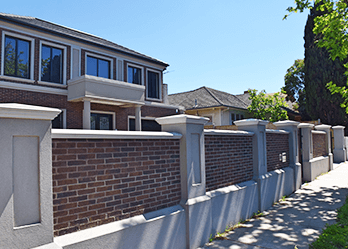 From contemporary brick fences to automatic or electric gates, you can rest assured we’ll have what you’re looking for at Custom Brick Fences. Contact us today to speak to one of our fence and gate specialists. In addition to Balwyn, we also provide services in Knox, Malvern, Mentone, Mitcham, Mont Albert, Mount Waverley, Narre Warren and surrounding suburbs.